The Coffee Bean & Tea Leaf® is proud to offer you a range of Specialty grade coffees we proclaim to be simply the Best. As one of the most popular beverages on the planet, you could say coffee has become something of an obsession with human beings. Today, the world knows two kinds of coffee: Arabica and Robusta, the former being our Specialty. Our roasting technique lets you experience the full range of sweet, distinctive flavours and aromas that it has to offer. To source the world's greatest coffee, our Green Coffee Buyer, Jay Isais, travels from one end of the tropic to the other to seek out hand-selected coffees directly from the best estates and small farms, ensuring the quality of our product. As you take your first sip of our premium Arabica coffees, let your mind travel to the equatorial wonderlands from where we purchase Specialty grade Arabica: Latin America, the Pacific, and East Africa. How your coffee looks, tastes and smells has much to do with where it comes from, and how it was grown. All our imported coffees have been cultivated at high altitude - between 3,500 and 6,000 feet - because cooler temperatures slow the beans' ripening time, and create more concentrated, flavorful coffees. To ensure that we offer you simply the best from each region, we personally travel to various estates to visit local growers and nurture long lasting relationships to find the best quality harvests. Forty percent of all our coffee comes from Costa Rica, one of the world's most celebrated source of fine coffee, and a leader in the global Specialty coffee trade. This country is also renowned for being a global leader in environmental preservation (conservation) as well. Coffee is a cornerstone of Costa Rican culture and tradition. Try a cup of our Costa Rica brew, and you'll agree that the country's coffee-growers - or 'Ticos' as they call themselves -- have raised the process to an art form. Coffee is grown and harvested at five distinct regions: The Central Valley, Terrazu, that in the south-central portion of the country, is where our Costa Rican variety comes from. Here, along the slopes of the 13,500-foot Galeras volcano, are some of the world's highest and most prized coffee-growing regions.With the help of families and neighbors, farmers pick, pulp, separate, ferment, wash, and dry their harvest on their own before delivering their parchments to local coffee mills for final drying, sorting, and grading. The most renowned of these mills - not just in Narino, but in all of Colombia - is the TrilladoraNarino Mill, run by the legendary Jose Enrique Vasquez. 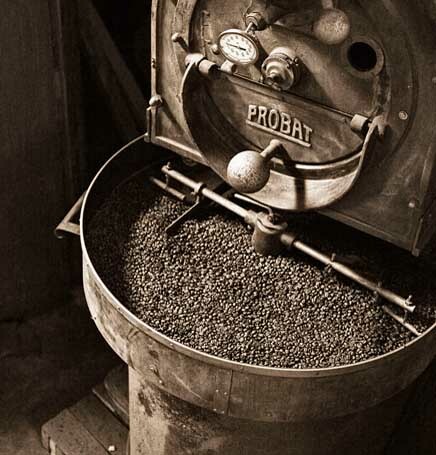 For the Best in Arabica, let's return to where it all began! The birthplace of coffee is also the original home of Arabica, the more complex and nuanced of the two known coffee beans (the other being Robusta). This East African country is where coffee thrives; if you travel around Ethiopia, you might find Arabica trees growing in the wild under natural shade. Under the professional guidance of Hugh Laird, who holds an eminent place in the island's coffee lore, the Sigri Estate has developed coffees of world-class richness and complexity. Laird's passion and mastery for coffee guarantees that his selections for The Coffee Bean & Tea Leaf® live up to the reputation we have set. On terraces as high as 4,500 feet, above the breathtaking Wahgi Valley, the coffee here is shade grown under Casuarina and Albizzia trees. By funding a small school for the workers' children on the estate's grounds, The Coffee Bean & Tea Leaf® is proud to have played a role in positively adding to the lives of the workers at Sigri, where great coffee goes hand in hand with conservation, sustainable agriculture, and healthy communities. Coffee, as they say, cannot be improved upon. It can only be ruined. So, while the conditions in which it's cultivated are excellent, we make sure that our fresh green coffee beans are roasted to perfection and perused for fragrance, aroma, flavour, acidity, body and finish designed to bring out each bean's inherent potential.Our Master Roaster uses state of the art techniques and expert instincts to preserve the unique richness of coffee drinking. Once the fruits are ripe, they are sorted out by hand before they undergo a thorough screening process that isolates the best of the bunch for final sorting and export. Dedication to Quality Unites Our Whole World! Travel to the lush, remote lands where our varieties of coffee are grown, and you'll notice stunning differences in culture, customs, language, and ethnicity. 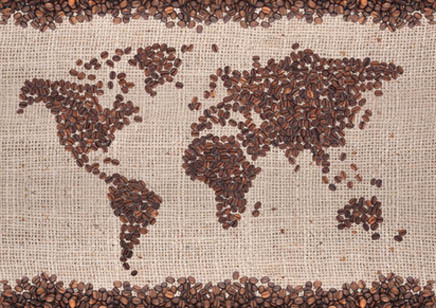 But our select coffee regions share many things in common. One of them is altitude. All our coffee is grown between 4,000 and 6,000 feet - the ideal range for growing coffee as the altitude facilitates slow ripening and the characteristics of the coffee fruit become much more concentrated which sharpens the aromas and flavors.The slopes of the terraces protect the trees from mountain winds, and a steady diet of nitrogen keeps the seedlings growing healthily. The harvesting process begins the moment the coffee cherries are plucked from the trees. There are two methods of removing these cherries. The first is Strip Picking, where the cherries of all stages of ripening are indiscriminately removed and taken for processing to accumulate them in bulk for mass production. The second method - the one that The Coffee Bean & Tea Leaf® uses exclusively is Selective Picking. This process requires finesse and expertise as the picker evaluates and selects only those cherries ready for processing. The Selective Picking requires someone keenly familiar with the coffee harvest that a mere glance and touch can glean quality in the fruit. It's Coffee Mastery in action. 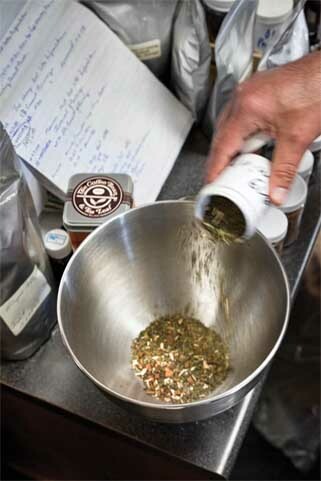 Before one of our delicious blends finds its way to your cup, it's first got to pass the test in one of ours. Cupping is the industry method of tasting a sample of coffee, scrutinizing it for the coffee's acidity, aroma, body and flavor. The cupping process starts with adding boiling water to freshly ground coffee and letting it steep for 2-3 minutes. After clearing the floating coffee grounds, the next step is to taste coffee by taking a spoonful and slurping it rapidly, so that it fills all parts of the tongue. The official green coffee buyer of The Coffee Bean & Tea Leaf® is Jay Isais, a coffee expert who cups all kinds of coffee that we purchase to ensure that they meet the flavour profile and standards that we expect from our products. for 100% quality. Coffee lovers are familiar with the light to dark spectrum of shades that coffees come in. Those gradations in shade are the result of the coffee's roasting process. Your favourite, The Coffee Bean & Tea Leaf® 's offerings may therefore range in color. Roasting emulsifies and caramelizes the sugars inside the coffee beans, drawing the sugars out as coffee oils onto the surface of the beans. The oils are what give coffee beans their shine; the longer the roast, the darker and shinier the coffee. A lightly roasted coffee will retain its original green color, and will boast a bright, crisp, and complex palate of flavors. And a darker roast would bear the intensity and aroma, which we associate with fuller bodied coffees. Blending enables us to match coffees of complementary tastes to create new, unexpected harmonies. Additionally, blending different variety of roasts together can reveal invigorating new avenues of taste. For example, a coffee blend that consists of a light roast and a medium to dark roast captures a broader spectrum of flavor. In addition to blending, flavoring can be a delightful way to add your confection to your favourite beverage.Flavored coffee does not contain additional calories or sugars and is considered a guiltless treat! Our authentic Kona coffee is grown at an altitude of 1800 to 2000 feet in rich volcanic soil along Hawaii's famed Kona Coast. 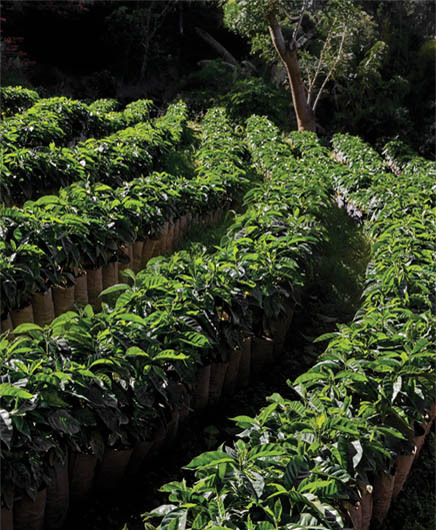 Each lot of Kona coffee is graded and registered by the State of Hawaii. 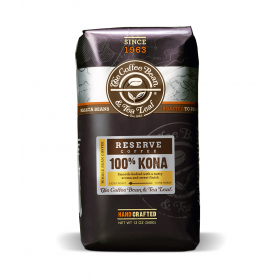 We guarantee that our Kona coffee is 100% pure quality. Smooth-bodied with a nutty aroma and a sweet finish. Mt. Hualalai, Kona coast, Hawaii. The geographic indication of Kona Coffee is registered with the State of Hawaii. Only genuine Kona from this region is legally allowed to be labeled as Kona Coffee. A mixture of Island culture and transplants from the Mainland U.S. who are sincere and casual, yet very serious about their coffee. 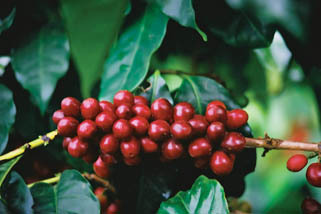 Coffee fruit is processed from small and medium sized farms alike. There is a limited number of processing facilities, so most of the small farm coffee is purchased by the larger mills or milled under contract. Our Jamaica Blue Mountain coffee is grown at the Mavis Bank Estate - one of the four certified coffee producers of Jamaica Blue Mountain coffee. This estate utilizes only spring water to sort the green beans, which are then put to sleep' for 3-4 months at 3000 feet where the coffee begins to develop, becoming a greenish blue color. Light-bodied with a spicy aroma, balanced flavor and a complex finish. Typical soft lush Caribbean profile with less acidity than Kona, but more complex. Established in the 1930's by Victor Munn, Mavis Bank was rebuilt by Munn's nephew Keble Munn in the late 1950s. The Munn family presides over the operations till today, processing the fruits from the original property along with the fruits delivered by thousands of nearby farmers. Fully washed and 100% patio-dried in the sun, the beans are processed at Wallenford Estate, a facility owned by the Coffee Board. Like Kona, the use of the name is affiliated with a specific region by law. Our Jamaican is a more specific product processed at the Mavis Bank Central Factory at proper elevation. Fresh Peaches or strawberries, blueberry muffin. Our Brazilian coffee is "Specialty Grade" natural (dry processed) coffee from the Cerrado region of Brazil, the world's largest coffee producing country. Soft bodied with earthy flavor and subtle walnut notes. Brazil is the largest producer of coffee in the world. 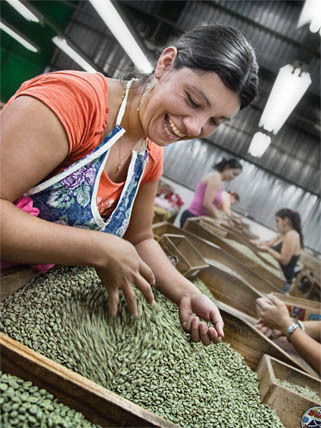 The Cerrado region is well known for its uniquely processed coffee. Natural dry-processed coffee uses a unique method which requires the trees to be nourished by water beyond the ripeness of the cherries. This process requires twice as much time because the fruit has to ripen, darken and dry on the branch. Fresh bananas, dates, banana nut muffin, carrot cake. Our House Blend is a combination of natural and washed Central and South American coffees. This longtime customer favourite combines brightness and softness for a flavor and an aroma that everyone can enjoy. Light-bodied with a subtle fruity aroma and buttery finish. Costa Rica, Colombia and Brazil. This blend is over one hundred years old! 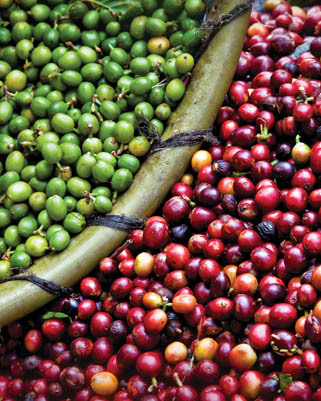 Costa Rican coffee is wash processed, while both Colombian and Brazilian are dry processed. Fresh peaches, nectarines or plums, currant or raisin scone. fragrant aroma. Each distinctive blend is roasted to perfection to add richness to every cup. Cultivated in the state of Narino, the premier growing region of Colombia, this coffee is hand-picked by workers at privately owned family farms who take great pride in their production, preparation and grading of each coffee bean. Full creamy body with well-balanced flavor and rich aroma. The State of Narino, Southern Colombia. Grown in all of the communities surrounding the active Galeras volcano, on slopes whose elevation often rises above 6,000 feet. The people of Southern Colombia are very warm-hearted and friendly. They have been committed to coffee farming over many generations. Their farms are small, and the families themselves comprise the labor with occasional help from their neighbors. Due to the large growing area and extended crop cycle, the coffee beans are washed, fermented and dried by individual farmers. Once enough coffee beans are collected, it is taken to TrilladoraNarino, the city of Pasto, for final processing, sorting and grading. Fresh bananas, peaches or nectarines. Honey raisin bran muffin, oatmeal raisin cookie. 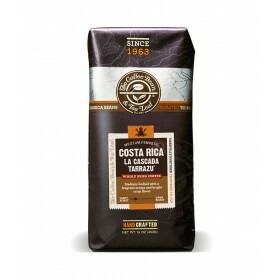 Costa Rica La CasacadaTarrazu is exclusively available at The Coffee Bean & Tea Leaf®. It is comprised of coffee beans from quality, high altitude family farms in the Tarrazu region to create a taste that is unique and satisfying. Medium-bodied with a fragrant aroma and bright crisp flavor. This coffee is slightly more complex than La Minita, with a bit more body. Alumbre River Valley, Tarrazu region, Costa Rica. This coffee is named after a waterfall on the Alumbre river, which intersects with the Tarrazu River. Average altitude is 4,500 feet. 300 individual, small farmers contribute 100% of their fruits towards our exclusive use. Most farmers are of second or third generation in the coffee business. Farm sizes range from a few acres to more than 200 acres. Coffee fruits are hand selected by farmers and are tendered for sale to our representatives at the mill, where coffee fruits are pulped, fermented, fully washed, machine dried and meticulously sorted to remove the imperfect beans. We then roast the coffee beans to a medium color to highlight the subtle character. Grown at the most optimal elevations, on the slopes of Mt. Kenya, our exquisite Kenya coffee is unsurpassed in quality. Tangy aroma with hearty body, gusty wine-like acidity and citrus flavor. The coffee industry of Kenya is noted for its cooperative system of milling, marketing and auctioning coffee, as well as the high percentage of production from small farms. It is estimated that 6 million Kenyans are employed directly or indirectly in the coffee industry. This Coffee is processed by the method of Wash Process. The coffee is graded after it is milled. Grades are based on the screen size of the bean. Beans with a screen sizes of 17 or 18 (17/64 or 18/64 of an inch) are assigned the grade AA; these are generally the largest beans. It is important to note that size is only one of the many factors in determining high quality coffee. Blueberries, caramel and butter croissant. Our custom blend combines Ethiopian Yirgacheffe and Java Estate coffees. 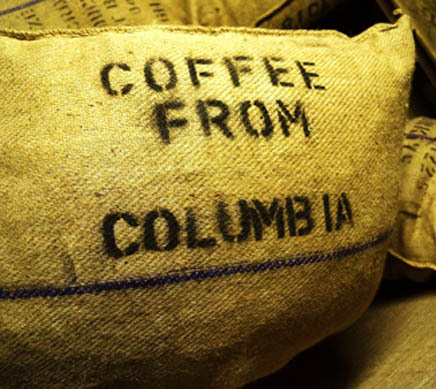 It's our interpretation of the world's oldest original coffee blend, long favored by coffee aficionados. Floral aroma and full-bodied with bright flavor and hints of citrus. Yirgacheffe, Sidamo region, south of Ethiopia's capital Addis Ababa, and Jampit Blawan Estate in Java, Indonesia. Mocha Java is one of the first successful coffee blends. The blend was made popular by the Dutch throughout Europe in the 18th century. The term Mocha is derived from the original name of the Yemeni port Al Mukha where the first Mocha coffee was traded. Both Yirgacheffe and Java coffee are fully washed. Fresh oranges or grapefruits, pecans, lemon poppy seed muffins and cinnamon rolls. Our Papua New Guinea coffee comes from the renowned Sigri Estate and is of 'Plantation A Grade', the highest quality available. Wahgi Valley in the Western Highland province of Papua New Guinea. The farmers of Papua New Guinea still live very traditional lives and the ancient tribal cultures still thrive in the mountains and valleys of the highlands. 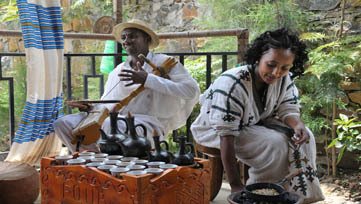 Agriculture was invented independently here, and many farmers now include coffee among the crops they grow. Fully washed, sun dried and hand sorted, this coffee goes through a three-day fermentation process broken up every 24 hours for washing. The Sigri process, unlike those of other estates, follows this up by totally immersing the bean in water for one more day, producing a superior coffee. Apples, caramel, and almonds, walnut coffee cake, cheese cake. Our medium-dark to dark-roast coffee is full-flavored with a bold taste and a rich aroma. Aromatically complex, each kind of coffee has a distinctive flavour that is well balanced. From tree to bag, this premier coffee is hand picked by workers on small family owned farms in the state of Nariño, on the Pacific Coast in Colombia. The farmers take great pride in growing, picking, and preparing their products by hand. And we are more than happy to offer you the results of their hard work. Their dedication pays off in a balanced, bright cup of coffee, richly aromatic with a creamy body. Creamy and smooth-bodied with a smoky aroma and well-balanced flavor. The coffee has enough character to stand up to the darker roast and still show its personality. While not as dark a roast as the French Roast, the roast develops some caramel and bittersweet finish to compliment the underlying coffee. The predominantly Catholic people of Southern Colombia, who are warm, friendly, and their commitment to growing coffee has been a strong one for generations. Their farms are small and the families members themselves comprise the labor with occasional help from their neighbors. Due to the large growing area and extended crop cycle, coffee is washed, fermented and dried by individual farmers. Once enough coffee is collected, it is taken to TrilladoraNarino, in the city of Pasto, for final processing, sorting and grading. Fresh raspberries, chocolate, chocolate croissant, chocolate muffin. Our Viennese Blend brings selected coffee beans together at the medium-dark roast level for a surprising balance and depth. Medium bodied with a rich aroma, full flavor and nuances of chocolate. Bright qualities from Costa Rica combine with the fruity earthiness from Brazil, roasted darker to bring out the bitter-sweet chocolate notes. Our experienced roasters design this blend to be an all-purpose dark blend with a broad appeal. A combination of washed and dry techniques is used to process the blend. The original, two types of coffee are roasted individually. Fresh blueberries or cherries, chocolate chip cookie, brownies. French Roast, a delightful Coasta Rican Coffee, is crafted in the famous, traditional European Style. Velvety body, caramel like aroma, earthy flavor and a bittersweet finish. The French Roast captures a full range of characteristics, from crisp and bright to syrupy, earthy and full bodied. 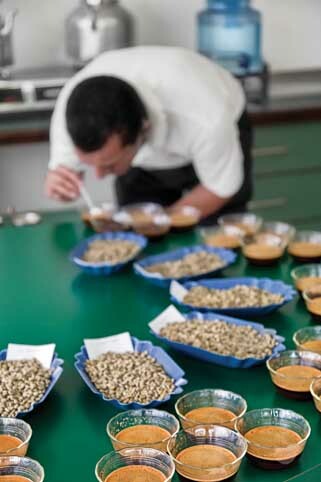 A range of roast degrees also lends more complexity and versatility to the blend. Our experienced roasters prepare this blend to work well as drip coffee and provide a balanced profile that lends well to lattes, cappuccinos, or as a straight shot. Each type of origin coffee is carefully roasted individually to its optimum level and then combined in the right proportion to create the final blend. There is a total of four types of coffee, one of which is roasted at two levels, resulting in five total blends. Walnuts, caramel, chocolate, brownies, chocolate croissants. Fragrant toffee aroma with flavors of walnut and semi-sweet chocolate and a crisp black cherry finish. Fragrant toffee aroma with flavors of walnuts and semi-sweet chocolate and a crisp black cherry finish. Kintamani Highlands, North Bali, Indonesia. This coffee is grown at an altitude between 3,200 and 3,900 feet, under shade trees, with orange and tangerine trees planted between rows of coffee. Arabica coffee farmers in Kintamani are organized into traditional groups called SubakAbian. The groups act as rural cooperatives, which sell coffee in concert with export groups, and are said to be found on the Hindu philosophy of "Tri Hita Karana" (The Happiness Causes). This philosophy consists of the importance of the relationship of human beings to God, to other humans and to the environment. The coffee is organically farmed, althought it's not certified. Harvesting is done from May to October and only ripe fruits are picked. 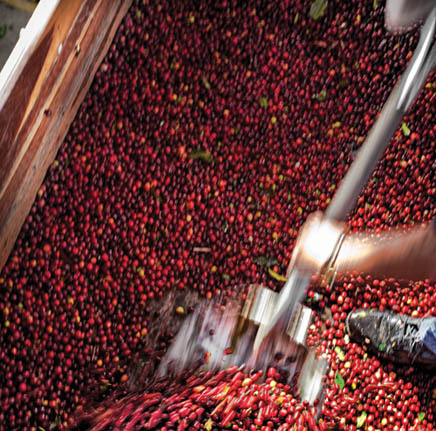 The coffee beans must contain 95% red fruit to be accepted for processing. The coffee is semi-washed, with a two-step sun-drying process. 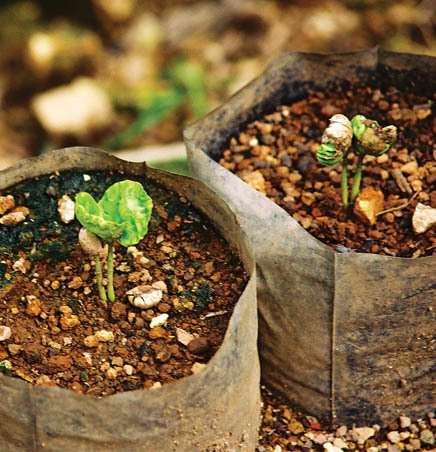 Our Sumatra coffee is cultivated from Mandheling, the finest growing region in Sumatra in the Indonesian archipelago. The ideal growing altitude of 2,500 to 5,000 feet produces one of the world's finest gourmet coffee. Deep aroma with a thick body and a sweet malty flavor. West-central Sumatra near the port of Padan-Sumatra, Indonesia. While most types of coffee are named after the country or the growing region where they are farmed and harvested, Mandheling Coffee is named after the Mandheling People, who traditionally farmed and processed these coffee beans. This coffee is semi-washed - a process in which the outer skin is removed in a fashion similar to the wet process. Once the skin is removed, the pulpy mucilage is left to dry on the bean. This process makes for a fruitier taste and stronger, heavier body. Pears, caramel, cashews, cheese Danish, chocolate croissant, butter croissant. All our distinctive, flavored, types of coffee are made with pre-ground, medium-roast coffee beans and flavored entirely by hand. An exquisite dessert, or a sweet coffee concoction that you can fancy at anytime. 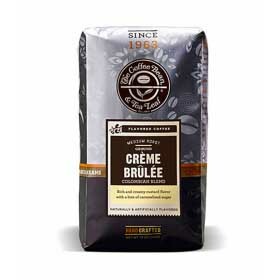 Swirling with aromas of vanilla and rich cream, and flavors of caramel and buttery vanilla, the delicious Creme Brulee from The Coffee Bean & Tea Leaf® is sure to delight. 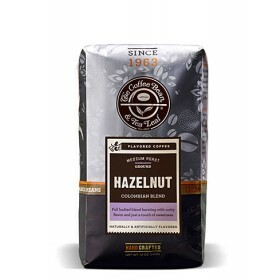 The wonderfully intense aromas and earthy, full-bodied flavour of our Hazelnut Coffee stands front and center, so you won't miss a single, seductive moment. Let's face it: The French perfected vanilla. But The Coffee Bean & Tea Leaf® has gone one further and perfected French Vanilla flavoured coffee. The coffee's sweet aromas offer hints of the French tradition of making custard with vanilla, cream, sugar and egg yolks. With its buttery, satisfying flavour, it's surely tresmagnifique! We offer the finest decaf selections for coffee lovers who crave for their favourite beverage without the caffeine kick. Our strong, subtle Decaffeinated Espresso has become one of our signature blends, bringing together the best four types of select origin coffee. Each type of coffee is individually roasted to perfection before blending. The subtlety of our Decaf Espresso lets you enjoy the straight shot, yet it's assertive enough for a latte. We begin with our delicious, ever-popular Costa Rican coffee, and roast it dark in the French tradition. Let your taste buds savour the caramelized sugars, the hints of chocolate and the deeply smoky flavor, characteristic of the classic dark roast. Enjoy a cup of our rich, flavorful Decaf French, and slip away to that French cafe of your dreams. Enjoy the flavor without caffeine! Our House Blend offers a smooth, satisfying coffee experience. We blend a selection of natural and washed Central and South American coffee, chosen for brightness, flavor, and aroma, to create a House Blend that's refreshing and delicious for your all-day enjoyment. Got a question about coffee? You've come to the right place. 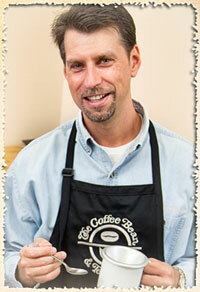 Jay IsaisisThe Coffee Bean and Tea Leaf's® mastermind of coffee, and he's got you covered. Jay Isais, The Coffee Bean and Tea Leaf's® mastermind has got you covered. As our Director of Coffee, Roasting and Manufacturing, Jay savors the world's finest coffee growing regions, from Latin America and East Africa to South Asia and the Pacific, sampling and selecting the regions' best harvests and overseeing our blending and roasting process. The passion and dedication Jay brings to perfecting one of the world's most beloved drinks is immensely rewarding. So, don't be shy. You're among your fellow coffee lovers. Ask away! 1. What's the best way to store coffee? Ans.Sure. Light to medium roasted coffee have a crisp, more moderate flavor, and tend to retain many of the origin characteristics. A medium dark to dark roasted coffee is very intense, and, while it has lost much of the origin characteristics, it's fuller bodied and more intense in flavor. 2. What's the best way to grind coffee? Ans.The first rule to follow is to grind only as much as you need for one cup or one pot of coffee.Also, be sure to choose the correct grind. Each brewing method requires its own type of grind. To find out what type of grind is best, consult the instructions for the coffee maker you plan to use. You want to be careful because too fine a grind will result in bitter tasting coffee. 3. What're your suggestions for brewing the best cup of coffee? Ans.After grinding your coffee to the right texture, measure out the correct proportion of coffee to water. What I suggest, in general, is to start with two level tablespoons of ground coffee per 6oz of cold filtered or bottled water. Make sure you're brewing your coffee at the ideal temperature too - the water should be between 195F to 200F. 4. Why do you recommend filtered or bottled water? Ans.Coffee is 97% water, so any impurities in the water can easily affect its flavor. So, rather than tap water, we always recommend filtered or bottled water when brewing coffee to ensure the best tasting results. 5. Can you explain how the degree of roasting and the origin of my coffee affect its flavor? Ans.Sure. Light to medium roasted coffees have a crisp, more moderate flavor, and tend to retain many of the origin characteristics. A medium dark to dark roasted coffee is very intense, and, while it's lost much of the origin characteristics, it's fuller bodied and more intense in flavor. 6. Do you have any tips for pairing coffee with food? Ans.While everybody has his/her personal preferences, the general rule of thumb is to pair darker roast coffee with sweeter, richer desserts or food. Lighter bodied, brighter, more complex coffee tend to pair up better with neutral food. For example, our French Roast and Viennese Blend would both pair well with chocolates and cakes.